On 16 February 1999, six car bombs exploded outside Uzbekistan Government headquarters in Tashkent, killing 16 people and injuring more than 120. Shortly after the attack, president Islam Karimov visited the site of the explosions. He was flanked by two men in uniform: Rustam Inoyatov, the head of the National Security Service, and Zokir Almatov, the Interior Minister. Almatov and Inoyatov were president’s main enforcers. They were also engaged in a fierce struggle for power. President Islam Karimov appointed Zokir Almatov to preside over the Uzbek Interior Ministry (MVD) in September 1991 and, despite Karimov’s practice of rotating cadres, Almatov managed to maintain his position for more than 14 years. 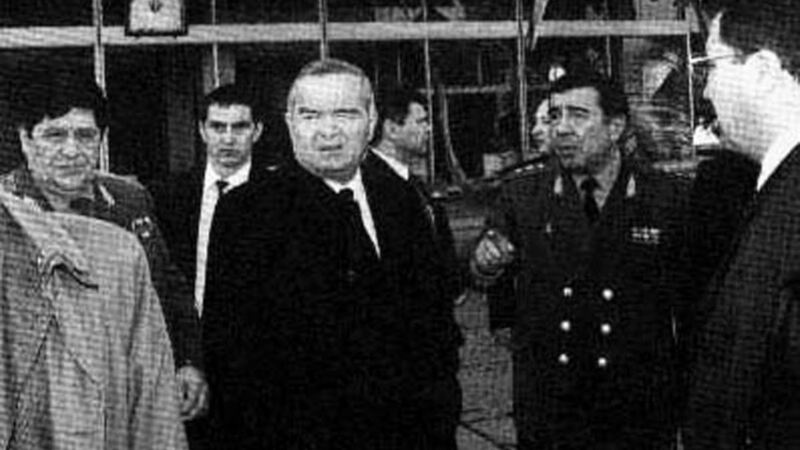 Commanding the most powerful armed forces in the country, Almatov was instrumental in securing Karimov’s authoritarian regime. While backing Karimov, Almatov seized power for himself. So, in 1995, the president decided to put another strong figure, Rustam Inoyatov, in charge with the National Security Service (SNB) as a counterbalance. Discretely encouraged by Karimov, Inoyatov entered into a competition with Almatov. It was an inter-clan struggle. Almatov, a senior member of the Samarkand clan was competing with Inoyatov, a key figure in the Tashkent clan, the other major clan in Uzbekistan. And it was also a battle for resources. Both MVD and SNB gradually expanded their influence beyond institutional boundaries, taking control over Uzbek economy and apparatus. Following the 1999 bombings, Almatov started a strong anti-terrorist and anti-extremist campaign. President Karimov asked Inoyatov to support MVD’s actions, placing the Interior Ministry in a position of prominence. Zokir Almatov held all the main levers of power in the country. In March and April 2005, a series of reports signed by the fictitious “Safar Abdullayev” were posted on the Internet. The reports claimed to disclose “Uzbek classified documents” according to which the Interior Ministry created a blacklist of journalists, activists and opposition leaders. According to the reports, MVD was preparing to arrest, imprison, force into mental hospitals, extradite or assassinate the blacklisted individuals. While attacking Zokir Almatov and MVD, „Safar Abdullayev” praised Rustam Inoyatov and the National Security Service. Inoyatov and the rest of the former KGB cadres, the reports said, “are more tolerant of the problems of the Uzbek people”. SNB was described as a highly professional organization, consisting of “honest” and “educated” people, and serving “as a deterrent to the repressions of the Zokir Almatov clan”. Despite being an obvious SNB fabrication, the series was very effective. Blacklisted journalists signed an open letter to minister Zokir Almatov. And, in an unprecedented and completely unexpected move, the Interior Ministry responded in a press conference for independent media outlets, denouncing the reports as “absurdity”. Almatov and Inoyatov were entering into a decisive battle. Strangely enough, days after the Safar Abdullaev series ended, the Andijan uprising began. Rumours about the unrest being the result of provocation by the National Security Service emerged in Uzbekistan almost immediately after the 13 May 2005 massacre. What is certain is that a couple of weeks after playing a major role in the suppression of the uprising in Andijan, Almatov disappeared. Amid speculations, the Ministry of Interior announced at the beginning of July 2005 that Zokir Almatov is sick and is in a hospital outside Uzbekistan. MVD stated that the minister will not return to the country in the coming days, since he is on a “short-term vacation”. It became obvious that Almatov’s position began to deteriorate: the special forces of the Interior Ministry – the elite unit in the department – were transferred to the disposal of the National Security Service and Ministry of Defence. On 23 December 2005, the long standing Interior Minister Zokir Almatov resigned, confirming the triumph of Rustam Inoyatov over his old rival. President Islam Karimov acknowledged his dependence on Inoyatov, and the SNB chief became the grey cardinal of Uzbek politics.